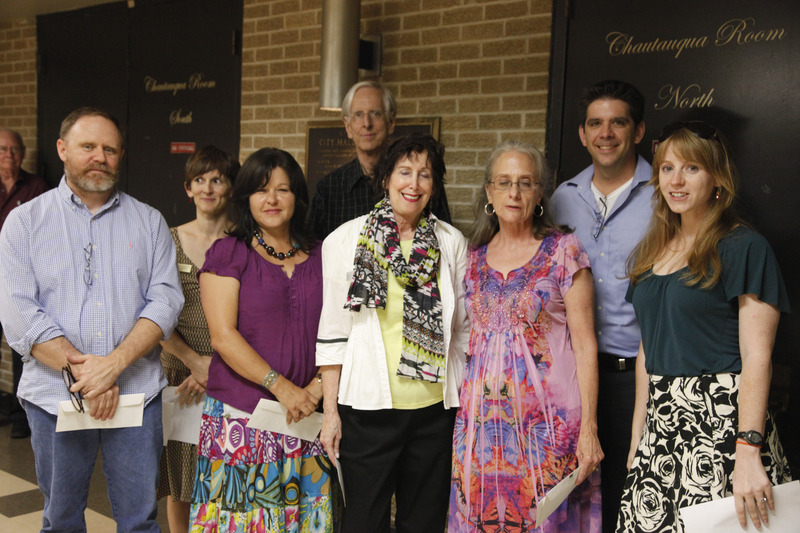 The North Central Louisiana Arts Council is proud to present the winners of the 28th Annual Peach Art Exhibit! For the Youth 9 & Under category, Honorable Mentions go to Starry Night Moon by Ben Boudreaux, Polka Dot Giraffe by Mia St. John, Aspens by Rebekah Webb; 3rd Place to Myself bySusie Welsh; 2nd Place to Thirsty Flowers by Valerie Chatellier; 1st Place to A Messy Room by Andy Lynn. For the Youth 10 to 13 category, Honorable Mentions go to Calla Lilies by Olivia Roger, Spring Has Arrived! by Destiny Bearden; 3rd Place toKing of the Desert by Jamie Palmer; 2nd Place to Apple Still Life by Lyndsay Claire Hogg; 1st Place to Neon Polly by Leah Price. For the Youth 14 to 17 category, Honorable Mentions go to Amber Waves of Grain by Rachel Lee, Les Aristocrats by Vivien Ballard; 3rd Place toPuppy Love by Leanna Epps; 2nd Place to Serendipity by Kathryn A. Bryan; 1st Place to Bengal Tiger by Morgan McCullin. And the Best of Show for the Youth goes to Lauren Hartt, for her drawing Charlie. For the Adult Miscellaneous category, Honorable Mentions go to Pulp, a handmade bookby Frank Hamrick, Purple Lotus, a digital paintingby Sherry Owens; 3rd Place to Leaving for La Foce, a mixed media piece by Kit Gilbert; 2nd Place to Reevaluation, a collageby Meredith McGregor; 1st Place to Life Cycle (Worm Rest), a printby Hillary Clary. For the Adult Original Crafts category, the Honorable Mention go to The Agate Sisters, a ornamental glass pieceby Betsy Gouedy; 3rd Place to Papa’s Memory, a collage of weathered wood by Lana Benson; 2nd Place to Lewellyan’s Fallen Oak, a natural wood tableby Patrick Blanchard; 1st Place to Origami Crane, a metal sculptureby Morgan McGough. For the Adult Photography category, Honorable Mentions go to The Gulls by Kori Teague, Blue Abyss by Shawn Hood; 3rd Place to Spearsville, LA, April 2014 by Laila Al-Agha; 2nd Place to Peaceful Fall by Kevin Beasley; 1st Place to Smooth Respite at 86th Street by Kevin Cuccia. For the Adult Painting category, Honorable Mentions go to Metamorphosis by Rebecca Bennett, Old Pottery by SC Hartt; 3rd Place to Peaceful Place by Connie Bryan; 2nd Place to Pecan and Shell by Peter Jones; 1st Place to Moon and Rocks by Marlen Waters. For the Adult Drawing category, 3rd Place goes to Vase of Flowers by Deondray Spivey; 2nd Place to Zentangle by Marlen Waters; 1st Place to Mike by SC Hartt. And the Adult Best of Show goes to Dianne Douglas, for her watercolor Ponchatoulas. Congratulations to all the wonderful artists on display. The show will be in the Ruston Civic Center until Saturday June 28. Artists should remember to pick up their artwork on Monday, June 30, between 10am-12pm when the show is over. Children can compete in one of three Youth Categories for $20 to $75; Ages 9 and Under, Ages 10 to 13, and Ages 14 to 17. Adults may compete in 5 categories for $50 to $150; Drawing, Painting, Photography, Original Crafts, and the Miscellaneous Categorythat covers everything from printmaking and collage work, to digital art works and more. Youth entrants may submit a total of 2 works per a child, for $10. Adults may enter no more than 2 works per a Category, for $20 per a Category. Anyone with a current NCLAC membership may receive $5 off his or her entry fee. If your family has a NCLAC Family Membership, then each family member that enters a piece into the Peach Art Exhibit may receive $5 off! If you want to enter work into the Peach Art Exhibit, bring your work to the Ruston Civic Center at 401 North Trenton Street, from 9 a.m. to 4 p.m. next Thursday, June 19th. If you do not already have an entry form filled out, there will be spare forms available at the Civic Center. Each work that is submitted must have a “Form A,” which will be given to the volunteers registering work into the show, and a “Form B,” which should be attached to your artwork in some way. If your piece is 2-dimensional please attach your form to the lower right back corner of your work. Do not forget! 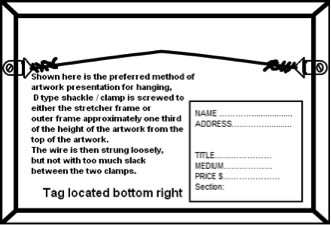 ALL works that are intended to hang on the wall for display MUST HAVE a wire or sufficiently strong string (not hemp-like twine) properly attached to the back of the work. Duct tape and fishing wire are NOT proper methods or materials. The example given here is the method we prefer entrants use to make sure their work does not fall off the wall during the show. Yes, is has happened before. NCLAC would like to thank all our sponsors that make it possible for us to provide our local artists with this show and prizes. Thank you Community Trust Bank, The Peach 99.3, Kit Gilbert’s Studio 301, The Fashion, Bank of Ruston, Ponchatoulas, Catherine & Winston McVea, Kelly Moore Bag, Janine & Richard Lewis, Elizabeth English, Stitchville, Fine Line Arts Supply & Print Lab, Dawn & Edwin Pinkston, Donnie Bell Design, Kathy & Chris Stone, The Children’s Shoppe, David Hedgepeth Interiors, Nora’s Flowers, Nancy & John Wallace, Saul Zalesch, Pastry Moon, Frame of Mind, and Tom Boniol & Cathi Cox-Boniol! This week's Art Talk is written by Laura Hunt Miller, NCLAC Executive Assistant. This year’s Peach Art Exhibit is brightening the hallways of the under-construction Ruston Civic Center right now, and the artwork is as good as ever. The Juror this year, Diane Dufilho of the Meadows Museum in Bossier City, had a tough time deciding this year’s winners, especially in the children’s categories. There were so many honorable mentions, we actually ran out of ribbons! After the awards were announced at the Opening Reception of the Exhibit on Sunday, the winning donor for NCLAC’s Keep the Arts Afloat Fundraiser was drawn; congratulations to Judge Robert James of Monroe! NCLAC thanks you, and all the other fundraiser participants for helping to keep the arts alive and thriving in our area for another year. The North Central Louisiana Arts Council would also like to thank all of the Peach Art Exhibit award sponsors again. 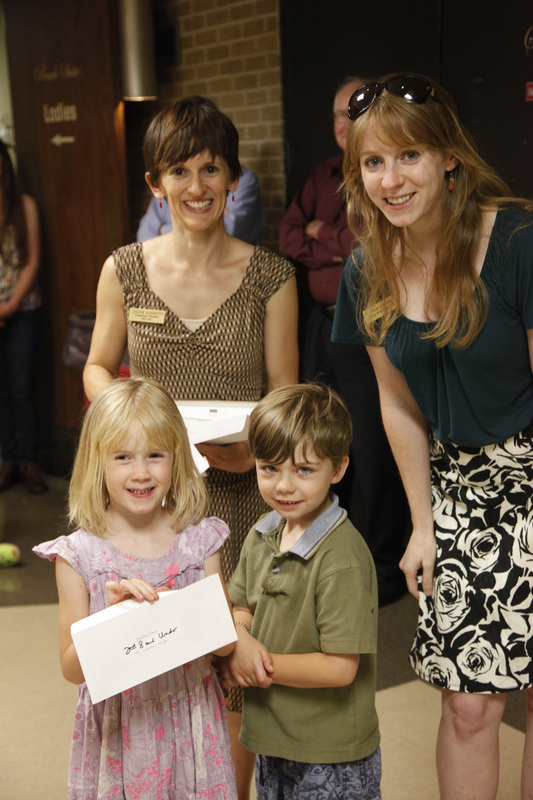 Each year these wonderful businesses and individuals provide over $1500 in awards for the Peach Art Exhibit winners. Are you ready to enter your artwork into this year’s Louisiana Peach Festival Art Exhibit? Artists of all ages are welcome to enter their work on Thursday, June 13th, at the Ruston Civic Center in one of the Peach Festival’s longest running showcases of fine arts and crafts, organized and hosted by the North Central Louisiana Arts Council for over 25 years. The show will open and awards will be given on Father’s Day Sunday from 3-4 p.m., and remain on display through the weekend of the Peach Festival. Community members and businesses come together to provide cash awards and ribbons in each category, 1st through 3rd place, as well as a $150 Adult Best of Show, and a $75 Youth Best of Show! Thank you to Community Trust, The Peach 99.3, Beta Sigma Phi, Bank of Ruston, Elizabeth English, Kelly Moore Bag, Janine and Richard Lewis, Stichville, Fine Line Art Supply, Dawn and Edwin Pinkston, The Fashion, Kathy and Chris Stone, Leigh Anne and Josh Chambers, Social Bites, The Frame Up, Nancy and John Wallace, and MaryAnn and Bill Willoughby for your gracious support! There are three Youth categories: “Ages 8 and Under,” “Ages 9 to 12” years old, and “Ages 13 to 17” years old. Each young person may enter a maximum of two artworks. There is a $10 entry fee for each youth. There are five Adult categories: “Opaque,” Transparent,” “Photography,” “Original Crafts,” and “Miscellaneous.” Each adult may enter a maximum of two works per an Adult category. There is a $20 entry fee for each category in which an adult enters work. Descriptions of the Adult categories are on the Peach Festival Art Exhibit Entry Form, which can be found on the NCLAC website at www.nclarts.org, or on the Ruston Chamber of Commerce website. You may also come by the NCLAC office at the Dixie Theater at 212 North Vienna Street in downtown Ruston to pick up a form. As a past participant, and coordinator of this event, I know just how exciting and encouraging this event is to our local artists, both young and old. So take out that painting or piece of pottery you were worried wasn’t good enough to show, and enter it in the exhibit-- you never know who will win. But remember! All 2-dimensional works must be framed and wired to hang on the wall to be eligible to enter! I hope to see you and your artwork at the show! It's spring, and the whirlwind of activity has my spirit full. 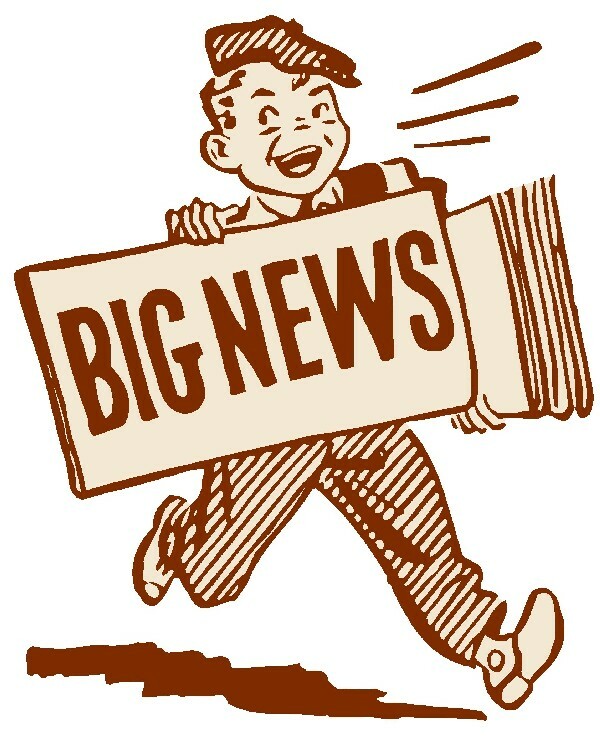 Today's post is full as well, so let's get started with the news! First up, Hooshang Khorasani currently has a solo exhibition in Bossier City at 1800 Prime in Boomtown Casino, as part of Bossier Arts Council's exhibition series. His April 4 reception includes wine-tasting and a $15 entry fee. Jerry Berg, of Louisiana Tech University, will be exhibiting at Livaudais Studio in Monroe for the April 4 Downtown Gallery Crawl. New works will be shown for this one night only event, and Jerry will give an artist's talk at 6pm. Congratulations to Christiane Drieling of Brush Hour Studio, who has been hired to teach art at Montessori School of Ruston. If your child attends Montessory School of Ruston, they will learn so much from Christiane. Jake Dugard, from Louisiana Tech's SoA Graduate program, will be interning at Hatch Show Print this summer in Nashville. Way to go, Jake! Dorene Kordal of Fabulous Felt has been invited on an all expenses paid trip to Peru Moda because of her award winning wool felt stitch sampler. Peru--whoo-hoo! AND, Dorene will be blogging about her experience here on our blog upon her return. At the Louisiana Tech Annual Student Show, currently on display in the School of Art, three NCLAC members won Red River Paper Honorable Mention Awards: Sophia Maras (our recently-moved Gallery Coordinator), Peter Hay and Casey Parkinson. Congratulations! Next, our very own technical writing intern, Jennifer Downs, was awarded the opportunity to present a paper at the Sigma Tau Delta conference in Portland, Oregon last week. We are proud for you! NCLAC's is now accepting artist entries for our exhibition spaces at Crescent City, Dixie Center Lobby, the Bridge Project with Bossier Arts Council, and early notification for large group shows in a new space being renovated at Louisiana Tech University's Student Center. Here is more information. The application is available in 'the box' at the bottom of your screen. The Twin City Art Foundation and the Masur Museum of Art are asking artists to help with our annual fundraiser. The Off-the-Wall Fundraiser will include a silent auction. Please consider contributing a work of art to this important cause! The money raised will help fund upcoming exhibitions, educational outreach, and educational programming for adults and children. It's your last chance to participate in this worthwhile and, frankly, very fun event! See more details here. NCLAC's Keep the Arts Afloat fundraiser is here! This annual event makes the arts council possible. We sell only 250 tickets, for $100 donations, and then we give away $5000. It's great odds, and it's a great way to make a tax-deductible donation. See any NCLAC board member to make your donation and get your ticket, call our office t 255-1450, or stop by the Dixie Center for the Arts at 212 North Vienna, Monday-Thursday from 9-3. The North Central Louisiana Arts Council is proud to announce that our 25th Peach Festival Art Exhibit was our biggest yet at almost 200 entries! The work currently on display during this week is a visible example of the large amount of talent in our region. We could not have hosted this event without our generous sponsors!! Below you will find a list of sponsors and our winners!!! The North Central Louisiana Arts Council is gearing up for our annual Peach Festival Art Exhibit which displays work from community artists during the famous Squire Creek Peach Fest. This year marks the 25th year that NCLAC has hosted the exhibit. 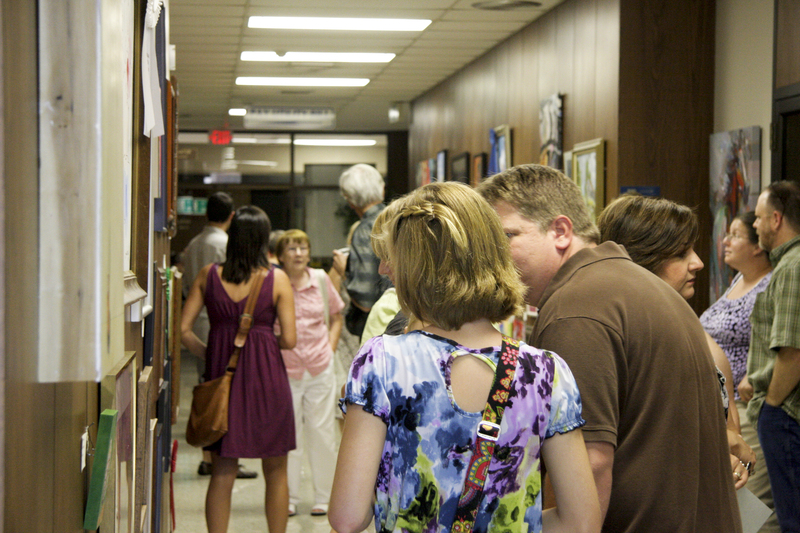 The work hangs from June 18th-23 at the Ruston Civic Center and is seen by thousands of individuals. All artists from student to adult professional to amateur are encouraged to participate. Adult artists may participate in the following categories: Opaque, Transparent, Miscellaneous, Original Crafts, and Photography. Children/Youth may participate in one of three age-based categories: 8 and under, 9 to 12, and 13 to 18. Great cash and ribbon awards will be given in all categories, in addition to a Best of Show award for Adults and Children/Youth. Entrants in the Children’s division can as win as much as $75, and Adults as much as $150 for best of show. 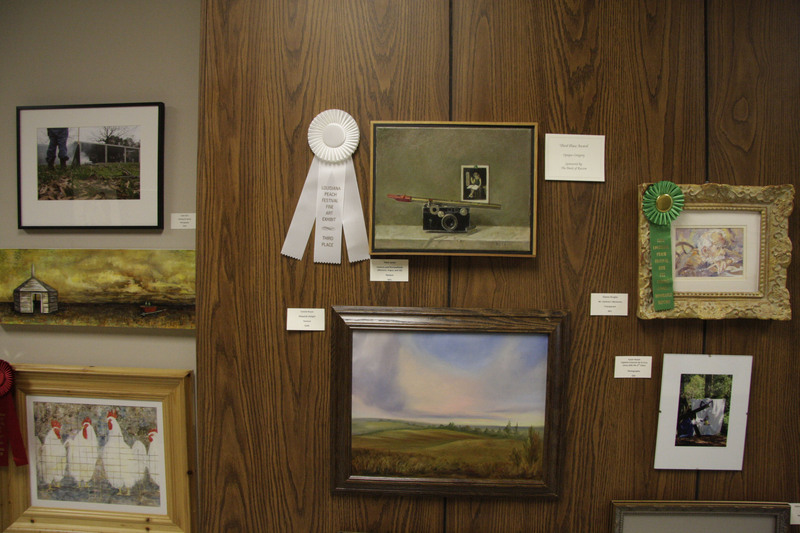 Every year the Peach Festival Art Exhibit is judged by a different individual. This year the exhibit will be judged by Evelyn Pell Stewart, Director of the Masur Musem in Monroe, Louisiana. In addition to Best of Show, and First, Second, and Third Place in each category Ms. Stewart can also award a limited number of honorable mentions. Artwork must be checked in, framed and prepared to hang on the wall, Thursday, June 14th between 9 am to 6 pm at the Ruston Civic Center. Artists may enter as many categories as desired, but will be limited to two works per a category. A non-refundable $20 entry fee will be charged for every Adult category an individual enters, and $10 for each Child/Youth category. If you are interested in entering the exhibit you can download an entry form from NCLAC blog at www.nclac.wordpress.com or fill one out when you drop-off your work. An opening reception will be held on Sunday, June 17th from 2-4pm at the Ruston Civic Center. Awards and cash prices will be presented around 3pm. In addition NCLAC will be drawing the winning ticket for Arts Afloat! We encourage all area residents to stop by and see some of the talent that our community has to offer. For more information please call 255-1450 or email us at nclac5@gmail.com. Peach Art Exhibit One Month Away!!! We are now one month away from NCLAC’s annual Peach Art Exhibit, a part of the Ruston Peach Festival! Every year both professional and non-professional artists display their talents and compete for the cash prizes. Entrants in the Children’s division can win as much as $75, and Adults as much as $150 for Best of Show! After having been to and having competed in the show myself for over 10 years, there are several things I always look forward to with the Exhibit. The Original Crafts Adult’s category is always has a wide variety of hand-made objects one can find, from baskets and birdhouses, to wooden bowls and ceramics. I love that every year there is someone who places in this category that is surprised and overjoyed that his or her beloved pastime is recognized and honored by others. I also enjoy seeing the amazing art that local kids have made; especially when you get to see their faces, and their enthusiasm for art, light up when they win a prize. Then there are the wonderful pieces of all sorts that I find inspire me as an artist to continue making art, and to try new and interesting ways to do so every year. Whether you are an artist, a friend or relative of one, or just need some general inspiration, put the Peach Festival Art Exhibit on your calendar for next month, and come out to the Ruston Civic Center to marvel at the local area talent with us! The Exhibit opens June 17th at 2pm, and will run the entire week of the Peach Festival. If you are interested in entering the Peach Art Exhibit, please see NCLAC’s website for Entry Forms. Work will be accepted on June 14th from 9am to 6pm at the Ruston Civic Center. Please make sure they are dry, framed, and wired for hanging so we can hang them properly for the show. The North Central Louisiana Arts Council invites you to participate in the 2012 Squire Creek Louisiana Peach Festival by entering your artwork in the 25th Annual Peach Festival Arts Exhibit, June 18-23 at the Ruston Civic Center. Adult artists may participate in the following categories: Opaque, Transparent, Miscellaneous, Original Crafts, and Photography. Children/Youth may participate in one of three age-based categories: 8 and Under, 9 to 12, and 13 to 18. Great cash and ribbon awards will be given in all categories, in addition to a Best of Show award for Adults and Children/Youth. Artwork must be checked in, framed and prepared to hang on the wall, Thursday, June 14th between 9 am to 6 pm at the Ruston Civic Center. Artists may enter as many categories as desired, but will be limited to two works per a category. A non-refundable $20 entry fee will be charged for every Adult category an individual enters, and $10 for each Child/Youth category. For an Entry Form or more information, please visit the NCLAC offices in the Dixie Center for the Arts, 212 North Vienna, or call 318-255-1450. You can also check our website www.nclarts.org or our blog http://nclac.wordpress.com.